Until about 800 A.D. changes in our alphabet occurred gradually. The alphabet evolved, with no clear-cut stages in the development of letterforms. This, however, changed dramatically after Charlemagne ascended the throne of the Holy Roman Empire in 771. One of the accomplishments of his reign is the Carolingian minuscule – the forerunner of our modern small letters. 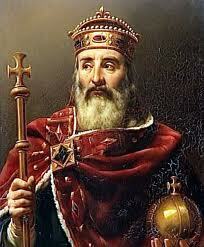 Called the “Father of Europe,” Charlemagne united most of Western Europe for the first time since the Roman Empire. His rule spurred the Carolingian Renaissance, a revival of art, religion, and culture under the auspices of the Catholic Church. During a visit to Parma, Charlemagne met Alcuin, a well-known scholar from England. Charlemagne was so impressed by the man’s wealth of knowledge that he invited Alcuin to undertake the organization of the educational system in the realm. Alcuin accepted the challenge, and began by standardizing a calligraphic style for the copying of manuscripts, texts, and educational material. This writing style came to be known as the Carolingian minuscule. 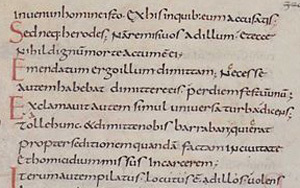 Carolingian minuscules replaced the cursive forms of previous writing styles, making letters independent of each other and also avoiding the use of complicated ligatures. When joined together, the combined Carolingian minuscules introduced only slight changes in form. Additionally, the letters were drawn more full-bodied than their predecessors. These design traits made Carolingian minuscules easily adaptable to movable type when Gutenberg invented typography. In the 15th and 16th centuries, the first type designers of Latin typefaces used Carolingian minuscules as models for the “lowercase” letters. This has continued into the 21st with no further evolution. Typographer using “uppercase” and “lowercase” handset type. 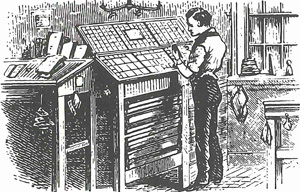 Until the mid 19th century, text type was cast in metal and set by hand one letter at a time. This involved so many pieces of type that separate “cases” (shallow trays with compartments for each letter) were developed to house the fonts of type. The small letters, which were used far more often than the capitals, were placed for convenience lower and closer to the typesetter: hence the name “lowercase” for these letters. Conversely, capitals were placed in an upper case, which is why they are frequently referred to as “uppercase” letters.